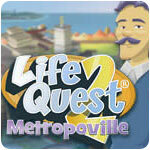 Life Quest 2: Metropoville Game - Download and Play Free Version! Life Quest 2: Metropoville is a turn-based simulation that asks life’s big questions. Just as in real life, you only have so many hours in a day and there will be some tough choices to make. Do you start work or go to school? Do you save or spend? Do you marry now or risk losing that significant other? With each choice you make, some doors open and some doors close, and you’ll have to navigate that maze. Most gamers will hear ‘life simulation’ and immediately think of Sims, but this isn’t a Sims clone. In fact, it has a lot more in common with the board game The Game of Life. What’s unique about Life Quest 2, however, is that it rewards your for planning, sticking to the plan, and paying attention to the little details. In Life Quest 2, some days are “big days” and it’s up to you to notice and act accordingly. The setup for Life Quest is that you’re a poor kid living in a crime-ridden neighborhood. The only thing set in stone is your desire to escape that life. You’ve just graduated high school, so here’s your chance. It all starts in the character designer screen, where you’ll select your gender and then define your physical aspects down to the finest details, such as hairstyle, eye color and even the shape of your lips. 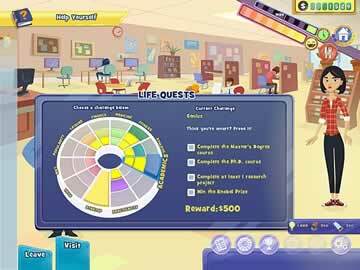 The structure to Life Quest 2 is what the game calls the 12-step program. The game is essentially a series of quests, twelve in all if everything goes well. Your task is to choose the most important life goal right now and then run with it, doing your best to roll with the punches that life throws at you. Your ultimate goal may be to become a lawyer, but it won’t happen if you never even get into law school. 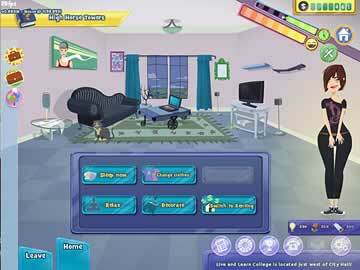 Quests in Life Quest 2 are broken into categories, such as Startup, Academics, Fitness, Popularity, Athletics, Practicality, Leisure, Toys, Relationship, Medicine, Law and Finance. For the professional athlete, the athletics category is a way of life and finances will determine if you have enough money to support yourself when the playing days are over!